Responsive Landing Page promoting a funny tee designed by ‘The Pete Design’ from Thailand. 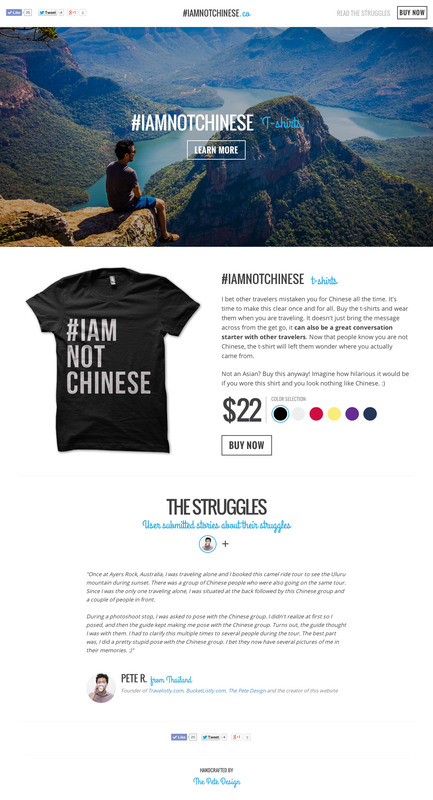 #IAMNOTCHINESE - The Official T-shirt Designed by The Pete Design. I bet other travelers mistaken you for Chinese all the time. It's time to make this clear once and for all. Buy the t-shirts and wear them when you are traveling. It doesn't just bring the message across from the get go, it can also be a great conversation starter with other travelers. Now that people know you are not Chinese, the t-shirt will left them wonder where you actually came from.